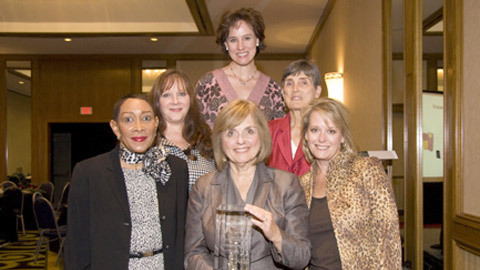 The Association for Women in Communications (AWC) honored Lois Phillips, PhD, as its 2011 Headliner Award recipient at the AWC National Conference, October 14, in Tulsa, OK. As founding President of the Santa Barbara chapter of AWC, she has worked diligently to attract new members across sectors and industries to build a new professional network for communications specialists in Santa Barbara, the first California chapter in many years. Since the Headliner Award was created in 1939, AWC has recognized outstanding achievements of over 200 distinguished professional members. Other speakers at the conference included Shawne Duperon, Emmy Award Winning producer, Terry Neese, PhD, President of the Institute for the Economic Empowerment of Women, and Billie Letts, author of Where the Heart Is and Shoot The Moon. AWC-SB members Rebecca Christenson and Lisa Angle also attend the Tulsa conference, joining members who represented 15 states. Dr. Phillips, a management consultant and trainer, leads seminars in presentation skills, media skills, and organizational communication for companies, agencies, professional associations, and universities. 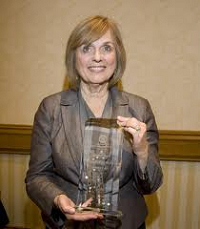 She also provides corporate training in Briefings and Media Skills, facilitates strategic planning retreats, teaches for UCSB Extension, and provides coaching services to executives who wish to communicate more effectively with stakeholders. As someone who delivers keynote conference presentations for professional associations and staff development events, Phillips is frequently interviewed by media. She has been an on-camera host and co-producer of two well-received talk shows on Public Access Television and co-host of Dialogues (KCLU/NPR affiliate) with (now Judge) George Eskin. In her book, Women Seen and Heard: Lessons Learned from Successful Speakers, Lois Phillips and her co-author Anita Perez Ferguson, addressed the number one fear of Americans, focusing on how women speakers – whether political candidates, advocates, or executive leaders– must first gain credibility as “the voice of authority.” Writing regularly about women leaders and advocates in the news for her blog, Phillips’ analyzes gender differences in speeches delivered by leaders across sectors and industries. Watch Lois’ talk in this video produced by Lisa Angle of Ninety Degrees Media. This entry was posted in News Articles on January 18, 2012 by awc sb.